If you have not read Book #1 Ashes of Twilight do not read further - Spoilers ahead! * A copy of this book was given to me in exchange for an honest review. All thoughts and opinions are my own. Wren's world has changed. The thing that she fought for, escaping the dome has come to fruition, but it's not the paradise she thought it would be. Most of the shiners have died, and according to James, she is to blame for many of the deaths, a burden which sits heavy on her shoulders. Still some have survived and Wren is determined to keep them safe as they fight to establish a home outside while hiding from the rovers who have weapons that can kill from far away. But as long as she has Pace she knows everything will be fine. Still Wren wonders, as she sees the smoke that continually pours forth from the dome, how did her friends inside fare? Will they ever find out if Lucy, David, Jill and Harry, along with Pace's mother survive the explosions? Meanwhile, someone else has also seen the smoke. A band of explorers from across the sea arrive in an airship, curious about the dome, and offering help to those who survive. When Wren meets the handsome Levi Addison, she suddenly questions her love for Pace as Levi offers to show her the world from his airship. Does she really love Pace? Or was it just the circumstances that made her think she did? Meanwhile, word arrives from inside via Pip, and Wren is forced to go back inside the dome, a thing that terrifies her more than anything else, to save her friends. Once she's back inside will she be able to escape again? Devastation: the perfect word to describe the beginning of this book. 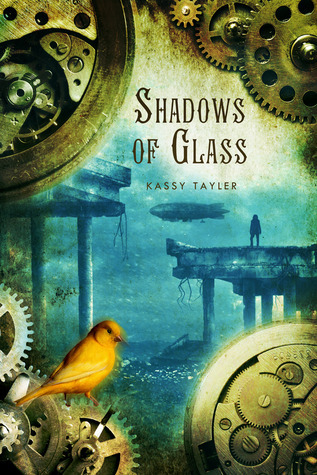 Kassy Tayler doesn't give you a chance to work your way back into the story, readers are immediately thrown into a whirlwind of emotions. So many have been lost in the floods, little ones forced to grow up fast and accept that most, if not all, their family are dead. Now they have to fight in order to survive the world outside the dome. Wren's character takes some major hits. She is strong, if not stronger, than she was in book #1, but now she has to burden some massive guilt. She is constantly questioning herself and her actions ( and I questioned her as well ), shouldering the blame for all that has occurred. It was hard for me as a reader to watch her go through this, knowing how hard she fought to get to this point. Pace is still around... but his and Wren's relationship is on the rocks a bit. Wren is unsure if her feelings are real, or the result of the closeness forced upon them by their situation. The world outside puts everyone through some serious challenges. Imagine experiencing thunder and lightning for the first time, having never heard of either of them and not knowing what it was?! Not only do they have nature against them, they now also have to protect themselves from the people outside the done. All they have heard about them are horror stories, and they have no way to defend themselves. Thankfully Wren meets up with some outsides that would rather help than hurt them! Newcomers Levi and his family are incredibly interesting! While there are many things to love about these new characters, my favorite thing they brought to the table was stories! I feel that too often in post apocalyptics/ dystopias the rest of the world is left out. All we learn about is the immediate surroundings. Even if this was a very small part of Shadows of Glass I still really liked that it was brought up. I liked hearing about the different countries and how each one is handling things differently. I have high hopes that we will learn more in book #3! These new characters also bring with them knowledge and skills that Wren and her people Desperately need. It was interesting to see how everyone took to the changes and how their personalities changed because of it. You may end up liking a character.. that you had some hatred for before. Shadows of Glass is not completely action packed, though there are some awesome scenes. This part of the story focuses on survival and learning about life outside the dome. The characters go through "character building" events that can never be undone.... Their lives are chancing rapidly and the ending will leave you wishing it was faster, and that you already held book #3 in your hands!